At home or at work, fabric furnishings can get heavy use and show soil and dirt quickly. ServiceMaster DAK professionals are experts at selecting the correct upholstery cleaning system for particular fabric types and soil conditions. For all upholstery cleaning, our technicians use specially designed products, equipment and cleaning methods specifically designed for use on the fabric their working with. We ensure the correct cleaning method is used by sending an estimator out first, often times testing the fabric before we commit to clean, so the best choice cleaning method for a successful result is achieved. This is done at no charge to the customer making us unique compared to others in this industry. We truly are the cleaning people who care! ServiceMaster DAK provides a process that ensures the removal of soil while never risking damage to your investment. ServiceMaster DAK specializes in both wet-cleaning and dry-cleaning of your upholstery. In the office, modular systems, desk chairs, upholstered cubicles and other furniture get the same care we devote to your sofas and chairs at home. ServiceMaster DAK has courteous and professional technicians specially trained to clean all types of upholstery from herculon and micro-fiber to Haitian cotton and leather. Avoid direct sunlight: Modern furniture fabrics are usually very resilient to sunlight. However, under extreme exposure, even these show signs of fading. Plump up cushions often: Stuffing loses its ability to bounce back if not plumped up regularly. Plumping cushions will help them last longer. Rotate cushions often: Cushions not rotated may experience premature and unnecessary wear. To ensure a longer life for your cushions, rotate them often. 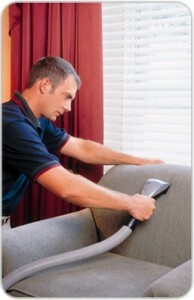 Vacuum: Upholstered furniture should be vacuumed on a regular basis to remove dust and loose dirt. Blot up spills: Spills left unattended may set as stains. Blot spills, never rub! Call us. We’ll schedule an appointment in the North, North Shore and Northwest Suburbs with a 2 hour window of our arrival time.